You may know that NorthBay Healthcare has a couple of hospitals—one in Fairfield and one in Vacaville. But did you realize it has an entire health care system as well, filled with primary care and specialty care services? 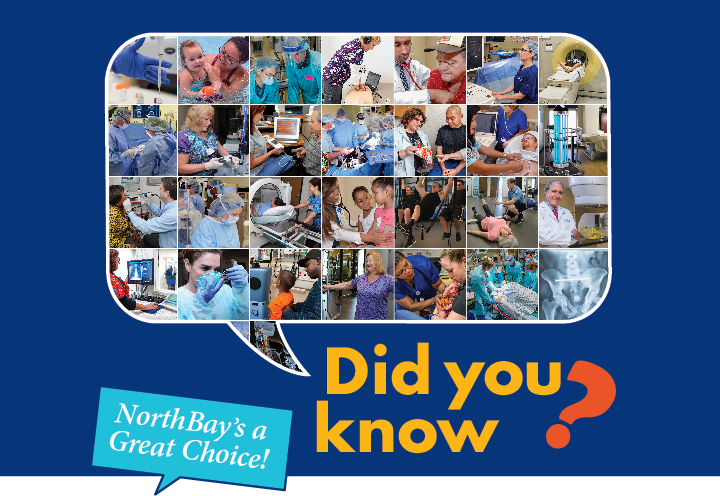 Did you know that NorthBay employs more than 2,700 men and women and has numerous medical office buildings at six locations—three in Vacaville, two in Fairfield and one in Green Valley? Would it surprise you to learn that brain surgeries and heart surgeries are scheduled every week at the NorthBay Medical Center campus? That stents placed in cardiac catheterization units actually prevent hundreds of heart attacks? That the most fragile babies get a strong start in NorthBay’s Neonatal Intensive Care Unit? And that the NorthBay VacaValley Hospital campus is home to the NorthBay Cancer Center and the NorthBay Joint Replacement Program? In fact, NorthBay Healthcare is the most comprehensive healthcare system based in Solano County. Solano County’s only medical fitness center is NorthBay HealthSpring Fitness in Vacaville. Your physician (NorthBay or not) can prescribe a Movement is Medicine Program that pairs you with a fitness coach for an eight-week regimen. In May 2016, NorthBay Healthcare became the first health care organization in northern California to join the Mayo Care Clinic Network. This formal agreement gives NorthBay Healthcare access to the latest Mayo Clinic knowledge and promotes collaboration among physicians to benefit patients. Breast reconstruction can be done at the same time as tumor removal, thanks to our oncoplastic surgeon. At NorthBay Medical Center in Fairfield, construction should be completed in 2019 on a new three-story wing that will house state-of-the-art surgical suites, 22 new patient rooms of the future, a new diagnostic imaging center, a café and more, as well as a major upgrade to our Emergency Department. If you need help quickly, we have you covered, from Care ’til 8 for after-hour needs, to Urgent Care (especially for non-NorthBay patients) and 24/7/365 emergency room service at both Vacaville and Fairfield hospitals. Looking for acupuncture? Osteopathic Manipulative Medicine (OMM)? Help managing diabetes? Pain management? All are available at the VacaValley Wellness Center. If you have gastric issues, your best bet is at the Green Valley Health Plaza. Whether you’re looking for labor and delivery services or end-of-life care (hospice and bereavement), NorthBay has it covered. “NorthBay Healthcare has an impressive array of services to offer,” said Kelly Rhoads-Poston, senior marketing representative and health plan specialist. That’s why she’ll be on the road, visiting businesses and answering questions at health fairs during open enrollment, which is typically August through November. “It’s that time of year when most people get to select their insurance and their medical providers,” said Kelly. “If they have any questions, they should call me and I promise I’ll get back with answers. I can help you pick a primary care physician based on your preferences. The bottom line is that NorthBay is a great choice.” The number to “Ask Kelly” is (707) 646-3280.